Is it really possible to use the word delightful to describe a musical which includes a low life Lothario, sexual harassment, backstabbing, spousal abuse, assault and battery, abduction, card sharking, robbery, attempted murder, and suicide? It is possible, if that musical is Carousel, the latest production at Olney Theatre. Directed by Jason Loewith, Carousel is based on the 1909 stage play Lilion by Ferenc Molnár – adapted by Benjamin F. Glazer (perhaps a pen name for Lorenz Hart?). The play was reworked for Broadway in 1944 – with Molnar’s guarded blessing – by Richard Rodgers and Oscar Hammerstein II. After about six weeks of previews, the original stage production of Carousel opened on Broadway at the Majestic Theatre and ran for 890 performances. Repeating the success of Oklahoma (1943), Carousel was wildly received and won the 1945 New York Drama Critics Circle Award for Best Musical. 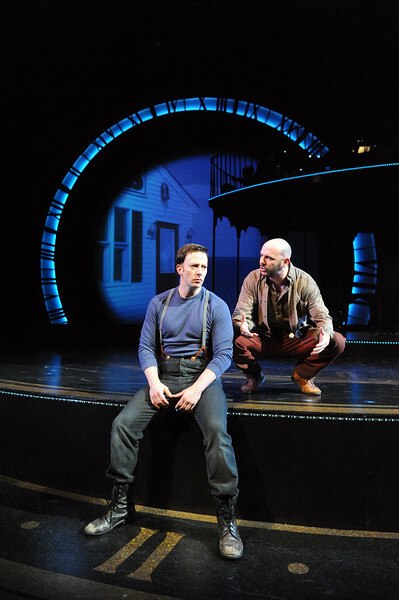 Carousel tells the story of a carnival barker, Billy Bigelow, and his ill-fated romance with a mill worker, Julie Jordan. A subplot revolves around the courtship of Julie’s friend, Carrie Pipperidge, with an aspiring entrepreneur named Enoch Snow. The play opens with a dreamy ballet sequence – The Carousel Waltz – which introduces the entire cast and sets the stage for the conflict which follows. Julie and Carrie come to the carnival to ride the carousel and to see the handsome hunk who mans the controls – Billy Bigelow. Julie is taken with Billy – a ne’er–do–well with a shady past, and he is likewise attracted to her. Neither is the marrying kind, or so they say in the number, If I Loved You. But their attraction to each other is enough to cost both of them their jobs, as Julie is dismissed by her boss, the mill owner Mr. Bascombe, for breaking a curfew, and Billy is fired by his wanton widow boss, Mrs. Mullen. Unemployed, the pair marry and move in with Julie’s cousin, Nettie Fowler. Billy’s lack of any marketable skill sends him off the deep end, with a series of despicable self-indulgences and a dangerous partnership with a petty criminal named Jigger Craigin. Jigger in turn tries to seduce Carrie and in the process nearly ruins her engagement to Enoch Snow. Even after Julie delivers what should be a life-changing announcement, Billy chooses a path which can only lead to perdition. The question is this: Will Billy ever find a chance at true redemption, either in this life or the next? Molnár’s Lilion is a dark, brooding play and Carousel carried that theme to the Broadway stage. So what makes Carousel delightful? The lyrical music of Richard Rodgers, of course, along with two ballet sequences by Agnes De Mille, and Oscar Hammerstein’s book, which added an element of hope. Pulling that mix together may be the reason that, in 1999, Time Magazine named Carousel the Best Musical of the 20th Century. 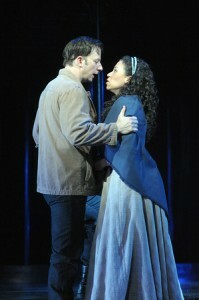 Olney’s revival aims to recapture the magic of the original musical, and for the most part, this production delivers. Mercifully, the second act ballet sequence (which in the 1945 previews ran 1:40) has been whittled down to about 15 minutes. But be fore-warned: even with this alteration, the show still runs close to three hours. Olney bucks the current propensity of using canned music in lieu of live accompaniment, and the small twelve piece orchestra under the baton of Christopher Youstra does not disappoint. The music throughout is touchingly rendered, beginning with the hauntingly beautiful opening prologue, The Carousel Waltz and ending with the always moving You’ll Never Walk Alone. There are no stand-out voices in this production, with the performers all pretty evenly matched. Technically, Tally Sessions, who plays Billy Bigelow, makes the most out his wide-ranging numbers. Sessions does a good job with the difficult Soliloquy and is nicely nuanced in his two takes of If I Loved You. Carey Rebecca Brown makes a pleasant Julie Jordan, though in truth, she may be a few years past the ideal age for the part. 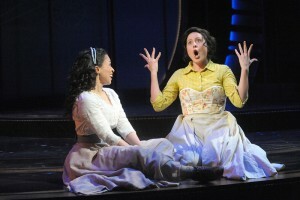 Brown’s acting is fine, however her voice tends to fade as each musical number goes on. Part of the problem appears to be with mics, which seem to go in and out at will. As Carrie Pipperidge, Dorea Schmidt is absolutely adorable. Schmidt’s singing is a bit quirky, but she uses those quirks to her full advantage. Her acting is top notch; she walks away with several scenes. And her take on being taken, in the Mister Snow reprise, leaves the audience howling. An unexpected surprise is Chris Genebach who portrays Jigger Craigin. Genebach completely captivates with the character who is easily the most unlikable persona on stage. His sinister side softens somewhat in his scene with Carrie/Schmidt, but make no mistake: Genebach’s Jigger is not to be trusted. Eugenio Vargas is a very able Mr. Snow, and Russell Sunday carries himself well as David Bascombe. The manipulative Mrs. Mullin is played convincingly by Eileen Ward. Delores King Williams completes the steady supporting cast as Nettie Fowler. Maya Brettell (Louise Bigelow) and J. Morgan White (as the carnival boy) danced effortlessly together in the second act ballet. Simon Diesenhaus makes a winning Enoch Snow, Jr. The ensemble is crisp from start to finish, even with the marginal numbers, This Was a Real Nice Clambake and June Is Bustin’ Out All Over. MaryLee Adams, Taylor Elise Rector, Christopher Mueller and Leo Christopher Sheridan are the most commendable of the effective group. On the creative side, director Jason Loewith captained a solid cast and presents a very entertaining (albeit tearjerking) show. Scenic designer Milagros Ponce de León has created a minimalistic yet beautiful and timely set which places the orchestra (appropriately enough) atop the carousel. Tommy Rapley’s choreography is fluid. The fight scenes – devised by Ben Cunis and executed by Chris Genebach – were very convincing. Both the lighting (Jen Schriever) and sound (Tony Angelini) are fine; a little eerie actually when Billy meets the Starkeepers. Seth Gilbert’s Guilded Age era costumes were eye-catching. Rachel A. Hirshorn is listed as the dialect coach, but aside from Eileen Ward’s faint Irish (?) accent, there is nothing distinctly notable or New England about anyone in the cast. Not sure if that is such a bad thing. Despite presenting one of the stage’s most detestable leading characters in Billy Bigelow, Carousel remains one of Broadway’s most enduring masterpieces; a reminder of how moving a compelling book paired with a melodious score can be. A tip of the satin top hat to Olney Theatre for staging this engrossing revival. Would that Broadway ditch the tiresome America’s-Got-Talent trend of recent years and produce more musicals like Carousel. Olney Theatre Center’s production of Carousel runs now – May 10. Running time is about two hours and forty-five minutes with one fifteen minute intermission. Olney Theatre Center is located at 2001 Olney-Sandy Spring Road in Olney, Maryland. More information may be found by visiting Olney Theratre online. We saw it on the opening night and agree that this is a wonderful plan and production despite its sad themes.